Jazzy is more than just a four-legged friend to Sam Hobbs. She’s her lifeline. “It was a lot more difficult to get around and I was in a lot more pain because I had to do all that stuff that she does now,” Hobbs said. Hobbs was born three months premature with a collapsed lung that caused brain damage leading to cerebral palsy. Performing everyday tasks causes her pain. Hobbs doesn’t let it stop her from living an independent life, though. She’s 27 years old, goes to college, and lives on her own. It wasn’t until she was in a car accident that she considered getting a service dog. The accident left her weaker than before and she was falling a lot. “My parents were worried about my safety because I lived alone, and I was (worried) too, so I looked into service dogs and thought it was a good idea,” she said. Jazzy, a three-year-old, black Labrador-golden retriever mix, has been with Hobbs for just over a year. Picking things up is not the only thing that Jazzy does for Hobbs. She can open the refrigerator, take off Hobbs’ shoes, take laundry out of the dryer, and, most importantly, bark to warn people when Hobbs is in trouble. Hobbs was fortunate and got her guide dog right away; many people in need are wait-listed, which is why Samantha Knapp started Kingston 4 Paws Academy. The business has been registered since last February. 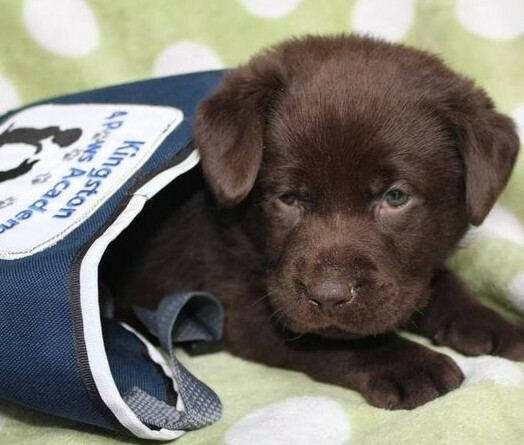 Kingston 4 Paws Academy is the first service dog company in southeastern Ontario. Knapp has been training service dogs for 13 years, she said. Knapp said she is looking for people to raise the puppies Kingston 4 Paws Academy takes in. Volunteers are provided with food, a crate, and everything else essential for raising a puppy for 12 months. The puppies also come with a service dog jacket. One of the only requirements of being a volunteer puppy raiser is that they must love dogs, Knapp said. Socialization is also priority in raising a service dog. The puppies can’t be home all day, so volunteers are expected to take them to work, or school, or just to the store, she said. Knapp said she understands how volunteers get attached to the puppies they’ve raised for a year, but when you see the family in need you’re giving the dog to, it’s worth it. You have to get past the attachment, Hobbs said. For more information about Kingston 4 Paws Academy go online to www.facebook.com/pages/Kingston-4-Paws-Academy/301177326649362.